For as long as Becky can remember, she has always had an obvious love for all animals domestic and wildlife, so it was an easy choice for her to join the veterinary field. As a child she always had many animals including dogs,cats guinea pigs,mice, chameleons, gerbils and fish. Becky was also cat mommy of 17 years to her sweet girl Penny who recently crossed the rainbow bridge. She was the neighborhood pet sitter – a passion she continues to this day. As a teenager she started volunteering at a local veterinary hospital, in addition to working for a local animal shelter as a pet therapy volunteer where she took puppies and kittens to local rest homes to visit the elderly. As a college student, Becky had the opportunity to gain experience as a volunteer aquarist intern for the Adventure Aquarium in Camden as well as an animal care intern at the Philadelphia Zoo. These new experiences also lead her to an affection for wildlife -specifically wolves. This second passion led her across the country to hike and explore such areas as Yellowstone, Glacier and Banff National Parks. These interests moved her to Ohio where she had the opportunity to work at the Columbus Zoo as a summer experience counselor and the Ohio Wildlife Center taking care of sick and injured animals. Her wildlife passion led her on a path where she met and worked as an assistant to an OSU Ph.D student conducting experiments with radio collared coyotes and their various vocalizations. On her wildlife path she was also given the opportunity to work as a volunteer Wolf technician conducting research for the US Geological Survey in the “Boundary Waters” of Minnesota. Becky anesthetized, collared and ear tagged wolves in the field in addition to recording their vitals, body and teeth measurements. Throughout these experiences Becky continued her education by graduating with a Bachelors degree in Biology from Glassboro State College and started working full time at the veterinary hospital where she had originally started her volunteer experience. During her 18 year service there, she returned to Camden County College to gain her Associates degree in Veterinary Technology. Becky is a new addition to the Housepaws family and is excited to work and surround herself with a passionate team! 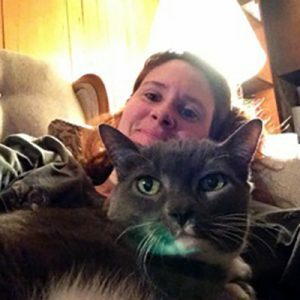 She loves providing a calm and stress -free environment for your pets and caring for their needs as well as helping owners with questions and concerns. Becky is dedicated to ensuring the best care and comfort for your loved ones! Becky grew up in South Jersey and loves spending time with her family and friends. She enjoys movies, hiking,camping,relaxing on the beach, traveling and an occasional “ghost hunt”.